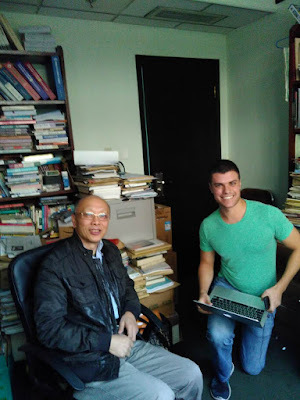 For my second professor interview, I decided to speak with my professor for “Social Issues of China’s Modernization.” This is one of the most popular courses at the HNC for good reason. The course focuses a lot on issues that have developed since China’s “Reform and Opening”（改革开放）and Chinese society still faces, such as wealth inequality, environmental concerns, China’s urbanization and city planning, and many others. However outside the content of the course, one of the main benefits of this class is learning from Professor Hua Tao. Professor Hua Tao has been teaching at the HNC for over a decade and has found a way to engage both international students and Chinese students so well that his classes are always among the most popular. Please tell me a little about your background, individual research, and when you came to HNC? I received my doctorate from Nanjing University in 1989. My research is in Chinese History. I came to teach at Hopkins-Nanjing Center in 1994. Once I started, the classes I taught were focused on issues facing the ethnic minorities in China. Next semester I’ll be teaching a class on that subject. However, I also focus a lot on issues facing Chinese Han society as a whole. I also teach a few classes on Nanjing University’s campus regarding China’s Ethnic Minorities and Chinese History. How long have you been teaching at HNC? This is my eleventh year. Can you describe the pedagogical techniques used at HNC? Each professor has his or her own teaching method. However, most Chinese professors, after arriving at HNC try to learn the American teaching style. By this I mean that they try to have their students participate more in class through class discussions, etc. However, Chinese professors may have some areas where they need to improve, so we encourage feedback from the students. What, in your opinion, is the biggest benefit to studying at HNC? In my opinion the biggest benefit for students is what we just discussed. Students use their target language in content courses. For international students, not only is this good to learn the teaching methods of Chinese faculty, but it is also useful to understand how Chinese faculty approach problems. Chinese students can do the same for the international faculty. At the same time, while living at the HNC, there is a very close-knit group. Nearly everyone knows each other and we discuss topics with everyone. So the HNC is a great opportunity for mutual understanding and learning between the Chinese and international students and faculty. In the future, we will need this kind of mutual understanding, so the HNC really is an important location for the future. What, in your opinion, is the biggest benefit to studying in Nanjing? Nanjing is not Beijing. Nanjing means the south capital in Chinese while Beijing is the North capital. Beijing right now is the political and government center. While studying there, true, it may be closer to and have more opportunities to understand China’s central government; however, due to the Internet, it is still very easy to understand China’s government while studying in Nanjing, which is the capital of one of China’s more developed provinces. In addition, in the Chinese context, it is much easier to openly discuss topics in Nanjing. There is a much greater sense of academic freedom here. Even after China’s “Reform and Opening” in 1978, and China becoming more and more free, there are still a number of topics in China that people need to be careful about discussing at large events, like press conferences. It is much easier to discuss these issues in Nanjing rather than Beijing. In addition, Nanjing is not Shanghai. Shanghai is very modern and international, but people in Shanghai have too many opportunities. Students will often lose track of their studies and engage in other activities. However it’s only about an hour to an hour and a half away from Nanjing. Finally, Nanjing is not too big of a city and it is still very convenient. What, in your opinion, do students often struggle with at HNC? Does it differ for International and Chinese students? One of the biggest problems is sometimes it is a challenge to engage with other students, especially between Chinese and International students. Of course, to solve problems such as these, the first thing we need is communication. This is important not only for the exchange of ideas, but also so students can help each other understand the material. Certain classes, such as my Social Issues of China’s Modernization course, have a large number of international students and only a few Chinese students, so my students sometimes encounter this problem. However, when students find ways to overcome this problem, it is a great experience for them. Have you kept in touch with previous students (Western and Chinese)? Where do most of them go (industry, govt., continued study) after HNC? I have maintained connections with a number of HNC’s alumni. For example, one former student who graduated four to five years ago is currently working in the American Consulate General in Shanghai. Every once and a while he comes back to HNC to give a lecture. In addition, when we can, we get together to play ping-pong with each other. In addition, another international alum that I have maintained connections with is currently living in Beijing and is doing research on Chinese studies. I have maintained relations with a number of the Chinese alumni. One former student is the Vice President of Guangzhou’s School of International Studies. Do you have any recommendations for incoming students to prepare for HNC? As soon as possible, adjust to HNC’s study schedule and lifestyle. That is definitely the most important point. And of course, try your best! Many thanks to Professor Hua Tao for agreeing to answer my questions.